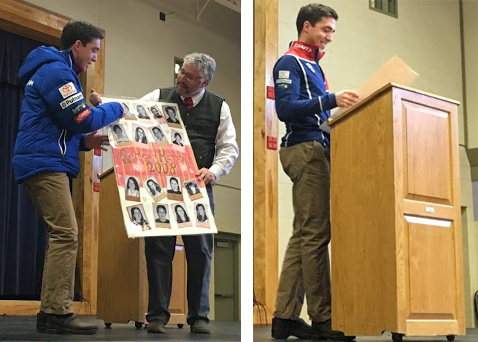 On April 6th at Morning Meeting we gathered as a school and community to celebrate Paddy Caldwell's return from his 1st Olympic Competition in Nordic Skiing. We are mostly proud of who he is, and how well he reflects our school values. The fact he is a really great nordic skier is also something that is true about him. The 9 years he spent as a student earned him a reputation as a good person by everyone who spent time with him, which is an accomplishment which can not be overstated. Congratulations to Margaret and Tim for raising such a great person. Congratulations to Paddy for being able to pursue something you love to do and achieving so much success at it as well. It is great to have you back, and as we all cheered, "Once a Lymie, always a Lymie!" Welcome home.